Great Sale! 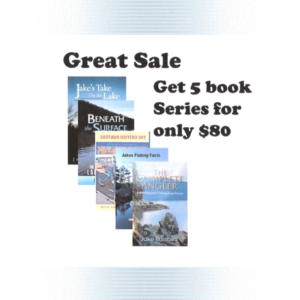 Get all 5 books in my fishing series for one price! Jake Bussolini has an educational background in engineering with a career that extended until retirement as a corporate executive. His scientific background explains his inquisitive nature which is reflected in his books where he tries to explain all aspects of the sport of fishing by presenting the science behind the sport. Jake is an avid fisherman who considered all of his fishing experiences to be research experiences because he keeps detailed logs of every fish caught, the weather conditions at the time, water temperatures, barometric pressure, water depth, fish condition, Sonar photos and much more. Many of the facts presented in his books are considered controversial but he backs all of them up with considerable details to support his conclusions. He is also a licensed pilot and aircraft owner who uses his aircraft to carry him to many remote lakes and rivers to gather new and exciting information for his books. He offers free lectures about his books and will appear if requested to talk on any subject related to fresh water fishing.